Rayco Eurospec Motorcars ordered a Ford Thunderbird, not a live raptor. 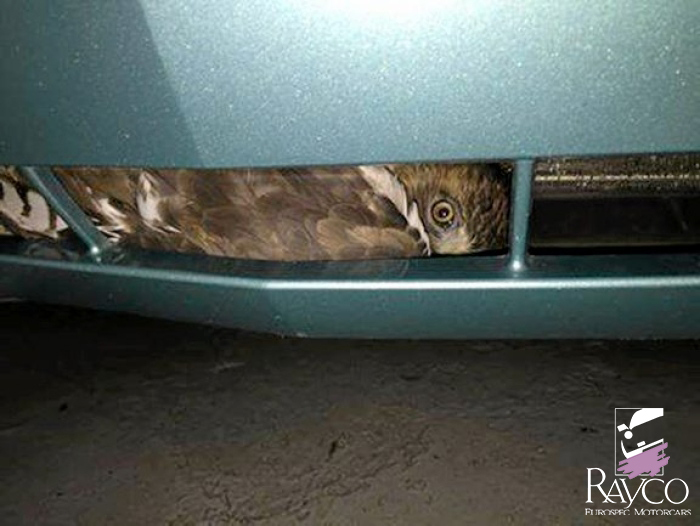 But when their shipment arrived at 715 Wyoming Ave. on Monday morning, they found just that — a live adult red-tailed hawk trapped in the front bumper of the car. The situation was discovered early Monday morning when an 11-car carrier arrived with a shipment, said Mike Budjnoski, dealer principal at the business. The driver of the transporter, which originated at Manheim auto auction in Manheim, told the staff that as he was heading north on Interstate 81, he saw a bird flying in front of the truck and that he thought it had flown over the top, he said. But the driver suspected something might have happened, he said. During unloading, a check of a 2002 Ford Thunderbird at the top front of the transporter revealed the hawk had in fact gotten lodged behind the car’s grille after colliding with the truck, he said. Removing the bird safely required cutting off the front bumper, destroying an $1,100 part that will have to be replaced, he said. The bird appeared to have entered at the bottom of the front bumper, breaking a stanchion and cracking the bumper cover as it entered, he said. The bird made it out “still very alive but shocked,” according to a post on the company’s Facebook page. The staff covered the hawk’s head with a towel to calm it and put it in a box to bring it to the Pennsylvania Game Commission in Dallas. An examination there determined the bird had a broken left wing but no internal injuries, the post says. Wildlife Conservation Officer Supervisor Peter Sussenbach said the Pennsylvania Game Commission had received the bird and transported it to the Delaware Valley Raptor Center in Milford. Jan Lucciola with the raptor center said the bird was on its way Tuesday afternoon and that she intended to examine it later in the day.